I grew up in a family that goes all out for every, and I do mean every holiday. My mom (although I call her a dork now...secretly wanting to be her when I grow up) is a holiday fanatic. So it's no surprise that she has green coming out the wazoo on St. Patrick's Day. She loves her little leprechaun earrings and buying us St. Patty's Day underwear, she has a shamrock headband and even green socks, but there was one day that she took the addition of green to our life way too far. I was in middle school and was coming downstairs ready to make a nice bowl of Lucky Charms, watch some Saved By the Bell and prepare for a long day of education. "Cling-Cling" the geometric shapes and colorful marshmallows filled my bowl. I open the refrigerator to grab the milk and about died. My "creative" mom had put green food coloring in the entire gallon of milk! All I kept thinking was mold, mold, moldy milk! Needless to say I did not have Lucky Charms that day or the next, and that milk probably sat in the fridge for four days without being used, until my dad, sick of starring at the disgusting chug, threw it away. That is one of my "fondest" memories of St. Patrick's Day, one I'll never forget and never do to my kids (when I have them). 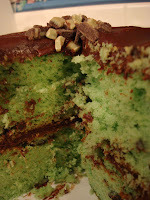 And while I may not have green milk, I will have green cake. 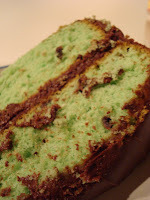 My vanilla cake got a few Irish kicks to it thanks to some Baileys and green food coloring. 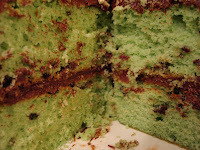 I also added a little mint flavoring and some chopped up Andes mints, with of course and overloaded amount of chocolate buttercream...mmm!